Download in PDF file format. Download in Word Document format. The Harvey Milk Foundation celebrates the second annual Harvey Milk Day with events in Sacramento, San Diego and its signature events in San Francisco. In hopes that other states will follow California’s lead by establishing May 22 as Harvey Milk Day, the Foundation has developed a new online campaign to track events set to honor Harvey Milk’s legacy on www.HarveyMilkDay.co. In 2009, the California State Legislature passed, and Governor Arnold Schwarzenegger signed, SB 572 designating every May 22 as “Harvey Milk Day.” SB 572 was authored by Senator Mark Leno and sponsored by Equality California (EQCA). 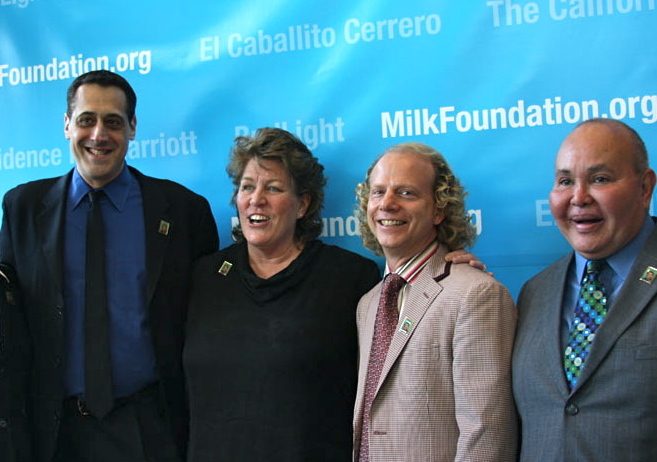 May 22, 2010 marked the very first “Harvey Milk Day” in history and official launch of the Harvey Milk Foundation. Harvey Milk Day 2011 sponsors: dot429; VSP Vision Care, the California Biotechnology Foundation; Equality California (EQCA); The California Museum; and many more. The Harvey Milk Foundation, established in 2010 as a non-profit charitable organization, promotes Harvey Milk’s legacy through education and outreach. Harvey Milk (193 0-1978) was the first openly gay elected official in the United States when he was elected to the San Francisco Board of Supervisors in 1977. He was assassinated in San Francisco’s City Hall in November 1978.The Foundation is lead and founded by Harvey’s nephew, Stuart Milk, and Anne Kronenberg, Harvey’s campaign manager and political aide. To learn more, please visit: www.MilkFoundation.org.